Multicultural, multidisciplinary influences merge in the 2,000-year-old South Indian dance practice, brought to life by Ragamala Dance Company. 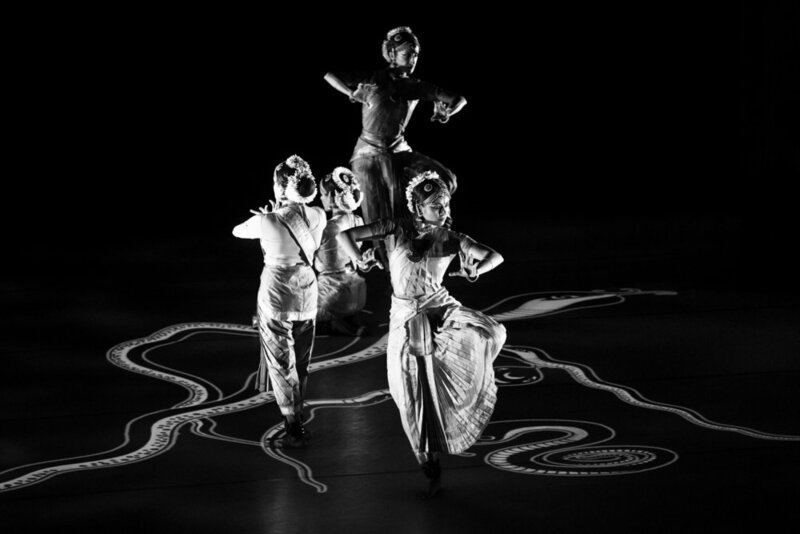 Ragamala Dance Company’s Written in Water is based on the Indian board game Paramapadam (the forerunner of Chutes and Ladders) and the 12th-century Sufi poem “The Conference of the Birds,” which details a journey through the seven stages to Enlightenment. Paintings by Keshav (from Chennai, India) are projected on the floor, and live music led by Iraqi-American jazz artist Amir ElSaffar pair with masterful dance. 1. We love that your dance company is led by a mother and daughter partnership. Does that sense of family translate to your industry and art form? For us, dance and family are inextricably linked. As first-generation diaspora artists, our creative work is deeply influenced by our cultural hybridity. For three decades, we have worked in an intergenerational and collaborative partnership. As mother and daughter, this partnership is a rare entity, in which family is an incubator to absorb lessons learned through past generations and evolve them into new artistic paradigms. Each of us contributes an equal voice, bringing a unique knowledge, point of view, strong aesthetic position and courage to relentlessly challenge one another’s perceptions. 2. What inspired you to create your own dance company; and how has it evolved since its inception? Our creative partnership started in 1984, when we began training under legendary dancer/choreographer Alarmél Valli. Although from different generations, we underwent this intensive training side-by-side. We spent four months every year in Chennai, India—practicing together, challenging and supporting one another, living and breathing this timeless, poetic art form. Our ongoing training under Ms. Valli, and the immersive experience of learning together as peers, is the bedrock of our aesthetic and foundation of our partnership. Ranee established Ragamala in 1992, with the mission of translating this deeply rooted Indian form for a global audience without compromising its intricacy or integrity. Aparna, who had been creating her own work since 1999, joined as a collaborator in 2004. Together, we have developed 30+ evenings of work. Over the past 26 years, our works have evolved in ambition, depth and scale. Developing increasingly substantial visuals, coupled with the precision and intimacy of our form. This gives the work an unusual duality, simultaneously intimate and infinite—that inspires our vision. 3. What moves you to create a new piece (e.g. : music, human nature, visual arts, etc.)? Each project takes several years to create. Through constant dialogue, careful thought, research and personal reflection we want to make absolutely sure that our voices are coming out through our work. We are inspired by a variety of sources that include specific musicians, visual artists, philosophies, texts or geographic locations might become the subject of a new work. The piece that we are bringing to the Walton Arts Center, Written in Water, takes inspiration from the ancient Indian board game Paramapadam and the 12th-century Sufi poem The Conference of the Birds. Using dance, live music and original paintings projected onto the stage, we aim to connect the human with the transcendent. 4. As first generation Indian-Americans, do you find there are certain cultural factors that influence your work? Thematically, we explore the myth and spirituality of our Indian heritage in order to engage with what we see as the dynamic tension between the historical, ancestral and personal. Through our work, we underscore that Bharatanatyam—the dance language with which we create—is a living, breathing language that speaks about the contemporary human experience. 5. Pick 5 words—that start with the letter ‘R’—that describe Ragamala Dance Company. 6. As an artist, what is your role in storytelling and carrying on cultural traditions? As first-generation immigrant artists, we feel a dual responsibility to honor the traditions of our birthplace while absorbing the cultural codes of our new home. In addition to performing, we believe that dance artists/cultural carriers are uniquely suited for activating communal engagement. Throughout our careers, we have developed meaningful outreach programming surrounding each new work to demystify our form and artistic influences. 7. What is the best advice you have been given? Pursuing a career as an artist comes with many joys and many failures. It is paramount to take the failures and turn them into opportunities for growth. That is the only way to improve yourself and be humbled by all the practitioners who have come before and will come after you. 8. Whom do you define as visionary? Our guru, the brilliant dancer/choreographer Smt. Alarmél Valli, provides an artistic litmus test against which we compare all of our work. When we first saw her perform, we were forever changed. We had never seen anything like her performance in our lives. She taught us that art is bigger than us and we need to respect the dance lineage we come from. Practice doesn't just mean doing the same thing day in and day out. Practice means exploring the depth of poetry, philosophy, musicality and theatricality that is the bedrock Bharatanatyam. There is an ocean of knowledge and we are humbled to only stand at its shores. 9. What do you hope audience members take away from tonight's performance? Live artistic experiences such as dance and music allow us to communicate across boundaries of culture and geography. Ragamala’s work brings together artists from different backgrounds to create a meaningful experience, allowing the audience to come away with awe and empowerment. Bharatanatyam is the externalization of internal emotions, philosophies and thoughts. The dancer must become completely absorbed in his or her dancing in order to make a meaningful connection with the audience. It is always our intention and hope that the performance will make an emotional impact on the viewer. When a newcomer comes to see us, we hope that they can see beyond the costuming and makeup, and that they focus on the visceral emotions and universality of the art form. What we do is ancient in origin but not in content. We present completely original work that combines a contemporary aesthetic with an ancient ethos.